Why us, Why Dr. Campbell? 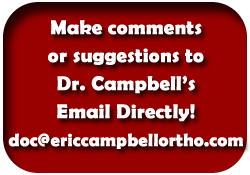 Welcome to Campbell Orthodontics, the website of Raleigh, NC orthodontist and Creedmoor, NC orthodontist Dr. Eric Campbell. We promise your interest in us will be rewarded! Our state-of-the-art practice straddles Falls Lake and is well-located in Northwest Raleigh 27613 near Brier Creek 27617 on Leesville Road near I-540, 540, and in Southern Granville County. Thank you for taking the time to learn more about orthodontic treatment and our practice. Dr. Campbell, a Board-Certified Specialist in Orthodontics, takes great pride in staying abreast of and utilizing those advancements in technology or comfort that truly benefit your experience with us. We utilize Clarity clear ceramic braces, SmartClip, Smart-Clip, braces, Damon System braces, traditional metal braces, Invisalign, and Invisalign Teen to straighten teeth and improve dental and masticatory function. Nevertheless, when it comes right down to it, Dr. Campbell uses what is tried and true, his ability to move teeth amid the chaos of relationships between cheeks, tongue, lips, and, for you younger patients, growth! Come see us to learn what plan North Raleigh Orthodontist Dr. Campbell recommends for you…don’t get caught up in the ever-increasing marketing…your most important choice is your orthodontist!!! Our practice is proud to accept benefits from virtually all PPO insurance plans, including MetLife, Cigna, Guardian, Ameritas, BCBS (Blue Cross Blue Shield), Aetna, Dentemax, etc. Please call us today to schedule a complimentary exam to learn the best orthodontic treatment plan options for you and/or your child. By providing expertise with compassion and integrity, you will find us the warm, friendly place everyone's talking about!! !